For $19.95 you will receive a personalized file which includes information you provide, such as your URL, Blog Name and Your Name. You can even include your phone number. You will receive the file via email. After purchase, we are sorry, but there are no returns. Just check out our SHOP for all the cute designs! 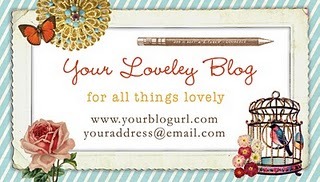 And we're going to be offering SLIM CARDS too...these are 1x3 inch cards which are cute and becoming popular with the blogging gang. If you'd prefer slim cards, please make a note to us when you order. Speaking of business cards...if you have so much information you'd like on a card and it just doesn't fit, there is a FREE solution. Have you heard of About.me? It's a great site where you can set up a "page" for free. You can upload a photo, have all your blogs and websites listed, your phone number, all your various email addresses, and all your social networking - all in one place. About.me gives you a URL that you can then place on your business card, people can then go to that one place to get all your info...it's pretty clever. Check out the one I made for myself here.